Interfaith leaders from around Michigan gathered at Masjid Mahmood, 1730 W. Auburn Road, Rochester Hills, the Ahmadiyya Muslim Community Center on March 15th as part of the Detroit Regional Interfaith Voice for Equity’s monthly meeting. Ahmadiyya Muslim Community hosted and welcomed 45+ leaders from various congregations. Imam Shamshad Nasir Regional Imam and Missionary of the Ahmadiyya Muslim community in Detroit kicked off the meeting with Islamic greeting of peace and welcomed the interfaith leaders to Ahmadiyya Muslim Community Center. In his welcome remarks, Imam Shamshad provided an introduction of the Ahmadiyya Muslim community and its founder Hazrat Mirza Ghulam Ahmad (peace be upon him). He elaborated the peaceful teachings of Prophet Muhammad (peace be upon him) and how Ahmadiyya Muslim Community truly adheres to those teachings in all of their actions including welcoming with open arms any and all faiths to our community center.He said that the doors of our Mosques are always opened for every one who desires to worship one God. Imam Shamshad said “Ahmadi Muslims are those Muslims who believe that the second coming of Jesus has been fulfilled in the person of Hazrat Mirza Ghulam Ahmad (a.s) of Qadian” The messiah that so many faiths have been anxiously waiting for including Muslims, Hindus, Christians and Jews, has come with all the signs and conditions foretold in the religious scriptures. Rev. John Harvey, Serenity Christian in Hazel Park, Rev. Louis Forsythe, Pleasant Grove MBC in Detroit and Rev. Louise Ott, Congregational Church of Birmingham later gave brief presentations on the DRIVE initiatives and encouraged DRIVE members to actively make the organization of the Interfaith leaders a successful and active by participating and becoming members. After the meeting, guests gathered in the gym area of the Ahmadiyya Muslim Mosque, for a delicious lunch provided by the Ahmadiyya Muslim Community. Many of the guests had the opportunity to take a tour of the mosque and the community center. The guests appreciated many of the displays in the mosque and library area. Many leaders took books on Philosophy of the teachings of Islam, life of Muhammad, World crisis and the pathway to peace and other literature, brochures. The interfaith leaders thanked the Ahmadiyya Muslim Community for inviting, hosting and for the delicious food. Many of the Interfaith leaders remarked that they had never been to a mosque and that this was their very first visit, they have been in a mosque. There were three leaders who specifically asked to continue further dialogue and interaction with the Ahmadiyya Muslim Community. One of the pastors asked if he can bring a group of 20+ people from his congregation to visit the mosque and have a dialogue with the Imam. He promised to get back with specifics and potential date and time.One pastor asked all the leaders to read the letter of Prophet Muhammad ( peace be on him) to Saint Catherine Monastery, in which total freedom is given to all faith on behalf of all Muslim. The program ended with prayers by Apostle John Harvey, followed by Lunch and Social Hour. 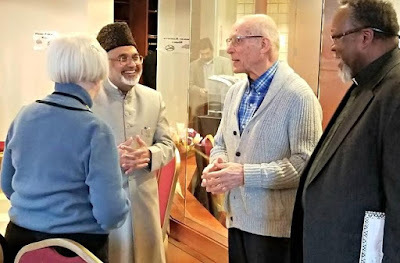 Many religious leaders met with Imam Shamshad and other members of the Ahmadiyya Muslim Community during the social hour and expressed their feelings of gratitude for hosting the meeting at the Masjid Mahmood. Interfaith leaders left with a great impression of the Ahmadiyya Muslim Community and showed interest in future dialogue.